Thanks to eagle eyed Glen, who spotted what looked suspiciously like one of our free downloads being sold on ebay. Having had a look we are sure it is, down to the markings made on the documents. There is nothing we can do, our page does say they are not to be sold, but I never thought it necessary to put anything on the actual documents. So, sadly I have now had to go through all the downloads and have added a copyright notice and also a faint watermark in the pages, then we will know they are from here in the future. I've also password protected the documents to prevent any part being copied out, or attempts to remove copyright. Such a shame when members kindly share their documents, plus all the time that I spent putting them together, many are photographs of documents which I've made into pdfs, took me a lot of time too. If you can spread the word that Romahome manuals, Romini manuals and lots of other useful technical documents are shared here for FREE, or if you know of anyone thinking of buying one, let them know. eBay listings all have a link for you to report an item. If you click it there are drop-down menus for you to give the reason: copyright infringement, listing practices etc. The link is not very prominent but it is usually on the right, on the same line as the tabs for Description and Postage, just above the Item Number. Thanks Paul. I'm not sure it would have covered us as there was nothing on the actual document to say it came from here, you have to prove ownership, which we have now taken steps to do. I contacted the seller to tell them that what they were selling was available free on our website, they didn't reply but have taken the listing off. Which all points to the fact that they knew they were doing wrong! It's a peculiar beast though, is copyright. In the case of printed/written works, the copyright belongs to either the writer or the publisher (if the publisher has bought the rights) until 70 years after the authors' death. It could be argued here that the publisher of the original manuals on this site own the copyright, not the website. Public domain and royalty-free journals, magazines, papers and manuals are usually over 100 years old! Of course there are exceptions to this ruling, and that is where authors or publishers have consented to waive the copyright or given permission for re-publishing. ...And you want to try explaining that to the art group, several of whom use published book, magazine and newspaper photographs as references for their paintings. 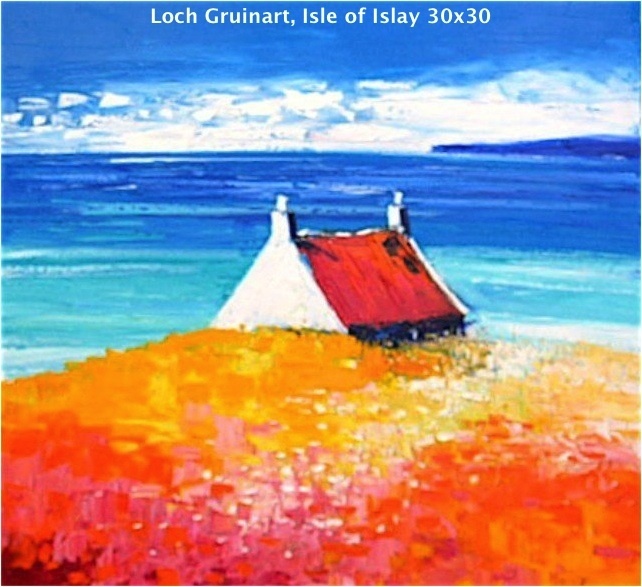 For example, I was just about to frame one of my paintings, when I remembered that I had taken as a reference a painting made into a greetings card by a Scottish painter, called Jolomo - and here's his painting. and here's mine - which included a different time of year, as I was there in the Spring... so bluebells rather than summer flowers. It still breaches the copyright! ..which is still, recognisable as his work, not mine. Unless I had stood in exactly the same place and taken my own photograph or sketch as a reference...and I could prove it if it came to a court case. I've been trying to explain that just changing a colour scheme but still copying a composition is still breaching copyright, but it's falling on deaf ears!! And actually, a member of the public pointed out that one of our artists had breached the copyright on a painting at our exhibition in November and complained to our Chairman. That's really interesting jayjay, you would think changing the painting and doing it yourself would make it yours. As regards the downloads we don't claim the information as ours and acknowledge the writer as the owner. But where I have made the said information into PDFs I claim ownership of the pdf to prevent them being sold on. Should Romahome decide to start selling the manuals, that's fine. Music is more difficult and a huge problem. Unless the local artist had sold a copy of it to the woman's magazine! And then sold you the original painting! Music, oh yes, there's another great copyright discussion!! That's what a lot of people think, Pauleen! But if the basic composition hasn't changed, then it's a breach of copyright. I was practicing using oil pastels, a new media for me, and just grabbed the first thing that appealed and had a go. Coming across it nearly 12 months later and I had almost forgotten what my original reference was! A lot of our artists think adding a tree or two, or an extra flower, or changing the colour scheme, makes it their own, but it doesn't if the basic composition remains the same. As I keep telling the artists at our local art club, either use your own photographs, or use copyright and royalty free images from sites on the web, or use two or three published photos of the same subject and make your own composition from a variety of sources. There are now loads of books that teach you how to paint, using step-by-step instructions... but these are for study purposes only and breach of copyright only comes in if you sell the resulting painting as your own. Which is why we got complaints at the last exhibition as someone had done just that... without reference to the artist, or reading the copyright ruling in the actual 'How To...' book. Claiming ownership of the PDF files is perfectly acceptable, BTW! Thanks Jayjay, that's what I thought, it's a bit like putting a name plate in a book that says "this belongs to" the copyright of the written word still remains that of the author but you claim ownership of the book as your own. Ebay, Here or recommended others ?